Happy Flashback Friday! Remember WAY back to September when there was this little half marathon in Disneyland. Then remember how I never even blogged about it. 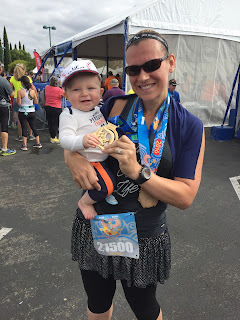 Well, luckily we have these days like Flashback Friday to give me an excuse to catch up with races long gone (I'm still blaming the baby for my lack of blogging). This was our 7th time running the Disneyland Half Marathon. We seriously cannot see ourselves ever not running this race! This year, with baby in tow, we had a bit of a different experience, from starting at the last corral to not really training well to worrying about Robby more than worrying about the race. We stayed at the Disneyland Hotel, so the start was pretty easy--basically a wake up, roll out of bed, and head to the start. Of course, this year since we were in the last corral, that meant add an extra hour of waiting before actually starting. The last corral was really a mixed bag of runners: some first-timers, some walkers, some like us who just didn't enter a proof of time. Everyone we talked to was super nice and we had some great conversations to pass the time. I would say the biggest drawback of the last corral is the waiting and the later finish. I'm one who likes to get miles ticked off before the sun rises, but on this morning, we were barely starting as the sun was coming up. The BEST cheer squad ever! Once we were on our way, the course was very familiar with a few noticeable changes. Mainly, it was significantly less time in the parks. Not mileage-wise, but actual foot time in the parks. I miss running up Main Street (you still run down as you go through the castle). There was lots of backstage and corridor running on Disney property, but I love being in the park itself, so the course changes were a bit disappointing. One noticeable improvement was the paving of the torturous stretch before you hit Angel's Stadium. 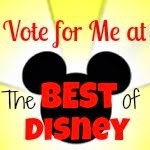 Of course, Disney has nothing to do with that, but it was nice to not have rocks and dirt in your shoes...as much. I still ended up needing to take my shoe off after the stadium and shake out some rocks. Onto our race experience: We had a blast running together! Prior to my knee surgery, I hated running with Bill. I was a more serious runner (yes, faster, but it wasn't a knock on him, I just trained more). I enjoyed being alone and pounding the pavement. After my surgery, though, I found a new comfort in running with him and making the run more social. We talk, laugh, and enjoy the race. We never even think of putting in earbuds because the miles just tick by with fun conversation. Yes, technically I think we slow each other down, but hey, I'm not shattering any world records here, so who cares?!?! We ran 1 minute run/30 second walk intervals the entire race. I have definitely found my happy place at a 30 second walk. Anything more than that and I lose momentum and really slow down. We stopped for pics along the way and honestly didn't feel too bad at the finish. Not too shabby for a pair of runners who did less than stellar training. There will be a day when we come back and race this race fast, but that was not in the cards for 2016. We're all registered for the 2017 race! I can't wait to complete the 5th Dumbo Double Dare, our one and only legacy race. On the course this year, we came up with our costumes for 2017, and they are FUN! I can't wait! Truly originals, so sorry friends, I won't be revealing them until closer to race day.